Crest on Lousada stationery obtained by Winton Harmon Lousada on a trip to London in the 1950s (when he met Marion Irene Keyser nee Lousada #246) together with Lousada sealing ring and imprint of Lousada sealing ring; all shown to Julian Land by Winton Harman Lousada April 2011. The motto has been changed to French from Spanish, no doubt because the 2nd Duke Emanuel lived in Paris (and Boulougne). This image was sent 2 Feb 2017 by Quirec Chantraine who inherited the seal. 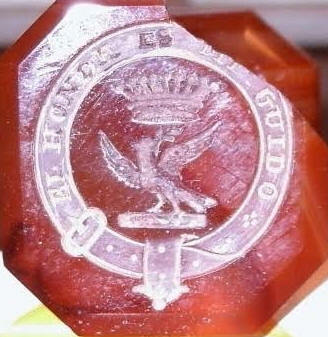 The motto 'El Honor es mi Guido' appears to be an Italian variation of the Spanish 'El Honor es mi Guia' and thus may reflect the 1741 Italian origin of the title bestowed upon the Duque de Losada. Perhaps Quirec is related to a descendant of the Marques de Valdecarzana rather than of the English Lousada Dukes.